An animal welfare charity has criticised the decision to return 12 dogs and sheep to a pensioner convicted of mistreating dozens of animals. Ann Wynd was found guilty of 29 counts of causing "unnecessary suffering" to animals at her home near Falkirk. Despite being banned from keeping animals for three years, the 75-year-old has been permitted to take eight sheep and four dogs home. The SSPCA said it was "extremely disappointed" by the decision. The group seized 65 animals from Wynd's smallholding at Standburn after police found emaciated dogs crammed into dirty cages in in her living room and ponies and horses in "filthy" conditions in sheds. 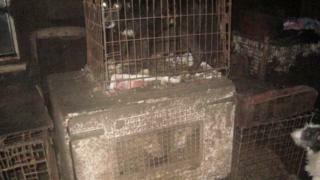 Inspectors removed 38 dogs, 12 sheep, nine Shetland ponies, three donkeys, two goats and a Welsh cob horse from the property. Several of the animals were in such poor condition that they had to be put down, while others have been rehomed. Scottish Society for the Prevention of Cruelty to Animals chief superintendent Mike Flynn said Wynd should have been banned from keeping animals for life. As it stands, a sheriff will review her banning order in December. Mr Flynn said: "This was, without a doubt, one of the most tragic cases we have ever dealt with. "Wynd's animals were caused a great deal of mental suffering due to the conditions they were kept in and their lack of socialisation. It was heartbreaking to see how frightened they were of everyone and everything. "Given the extent of the pain and distress these animals endured we are extremely disappointed 12 animals have been given back to Wynd and that more may be returned to her. "The scale of suffering involved in this case was horrendous and in our view would have merited Wynd being banned from owning animals for life." Wynd denied 29 charges of causing unnecessary suffering to animals including 19 dogs, two donkeys, a sheep, three Shetland ponies and a Welsh cob horse, but was found guilty after a four-day trial at Falkirk Sheriff Court. She was banned from keeping animals for three years, except for four dogs and eight sheep. The pensioner will also be under social work supervision for three years, as part of a community payback order which stipulates she must allow qualified vets to inspect her property and animals.